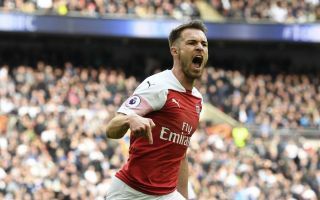 Aaron Ramsey continued his habit of scoring at Wembley on Saturday by giving Arsenal the lead in their Premier League clash with rivals Tottenham. Ramsey already had Wembley goals in two FA Cup finals and a Community Shield but he added a north London derby to that list when he danced around Hugo Lloris to finish off a first-half counter-attack. The Welshman will play alongside Cristiano Ronaldo nest season after signing a deal to join Juventus in the summer. And Ramsey’s goal celebration on Saturday was Ronaldo-like in its arrogance. Ramsey pointed to the Wembley turf and shouted something. Sadly for Ramsey, he had to share his f***ing pitch with Harry Kane who scored his THIRTY-SIXTH Wembley goal to equalise as Spurs fought back to draw 1-1.
? Wembley is Aaron Ramsey’s pitch and we’re all just playing on it ?